Take that, antivaxers! This is nearly the end…of 2017, that is—with puppies! As huge of a pain as it was to move the old blog over to this spiffy new setup, there was one advantage other than the spiffy new setup. That advantage was that the three or four weeks of downtime during which I transferred over twelve years worth of material over to the new site taught me that it’s OK to take time off from the blog every now and then. My traffic recovered faster than I thought it would, for one thing. True, it’s still not up to old levels, but I find these days that I don’t really care about my traffic the way I used to; so it doesn’t really bother me. It also means that, in case you haven’t figured it out already, I’m taking this week off—well, except for this post, which will not be about anything medical at all. I always reserve the right to change my mind if something happens between now and January 3 that I cannot resist. However, most years the week between Christmas and New Years is fairly quiet on the quackery front, as it is usually so on the news front; so I’m probably safe. We also will have a houseguest over the New Years Day weekend, which means that I probably won’t manage to post on January 2. Dora was my study companion while I was reviewing for my surgery board recertification last month. She’s a dog my wife and I volunteered to foster and now want to adopt. We picked her up in October. She’s one of the sweetest dogs we’ve ever met. There was a little catch—or should I say surprise?—six and a half weeks ago. Those of you who follow my Facebook feed and maybe those who follow my Twitter feed already know what the catch was. Dora, it turned out when my wife took her to be spayed, was pregnant with eight puppies. I had never seen a dog give birth before, and it was fascinating to watch. Over the course of five hours or so (from around 3 AM to 8 AM, of course), each puppy came out, and as it did Dora would lick the membranes off frantically. When it was over, there were eight new puppies, four black and four mixed white and black, overall six males and two females. Dora’s puppies, a couple of days old. Don’t blame me for the cat blanket. The dog shelter supplied that for us with a pile of other blankets. It wasn’t a lot of work at first because the puppies couldn’t walk and only consumed the milk that Dora provided. They were blind and deaf, as puppies are for the first weeks of life. Of course, as anyone who’s ever raised puppies (which now includes us) knows, as they grow, open their eyes, and acquire the ability to walk, things get…interesting. They also have to be introduced to solid food. Right now, at six and a half weeks, the puppies are pretty much weaned, and all that remains is to get them switched over from blended food to solid puppy food, which should happen within the next few days. And, finally, here they are this morning. They’re really becoming active! Yes, there’s a lot of pee around. One thing we’ve learned from these puppies is that it’s impossible to keep the pen clean for very long and that we just have to roll with it. And there is a lot of pee and poo to clean up, such that even cleaning it three times a day after feeding doesn’t keep up with it. Also, puppies aren’t the least bit concerned about stepping in it and spreading it all over the pen, but, being dogs, instinctively do not poop near their bed area. It kind of strikes me as a metaphor for life, actually. We’re still going to adopt Dora, but unfortunately we don’t think we can adopt one of the puppies because training a new puppy from scratch and seeing him through his…energetic…years is more sustained work than I think we can handle after this. I have little doubt that these cuties will quickly find forever homes after they go out in pairs to new fosters in a couple of weeks. We’ll be sad when they have to leave and we’ll miss the little buggers (puppy breath and kisses! ), but we’ll have our normal life back, no longer regimented to feedings followed by cleaning up copious poop three times a day, and our basement will no longer have that gross sickly sweet smell of puppy poop always hanging in the air. Fortunately, it’s a lot less intense than poop from an adult dog, but it is…different. Life’s full of surprises, and this one was a doozy. It’s been a hell of a lot of fun. I might have to do it again—after I’m retired and have the time. Maybe by 2030 or a bit later I’ll be able to do this again. In the meantime, here’s proof that I’m not as evil as antivaxers think I am. I love puppies. NOTE: The shelter for which we’re fostering Dora and her puppies is I Heart Dogs. Consider an end-of-year donation, if you will. Will 2018 be the year that the FDA finally regulates homeopathic remedies as drugs? Very cute! Merry Christmas and Happy New Year! Dora is gorgeous! She has the look of an old soul in her eyes. Those are some happy, healthy looking puppies you have there. Also, this post made me realize that I’m not following you on Facebook yet! Happy New Year! As much as I enjoy reading your blog, I hope that nothing so egregious happens that you have to cut short your blogging vacation. Oh, wow! They are adorable. When my younger son was about eleven years old he got a dwarf hamster from a pet store. A few days later his younger sister and her friend went to see the hamster, and found about eight more tiny hamsters in the hamster cage! The family needed more room, so we got more hamster habitats that connected together with tunnel tubes. They are nocturnal, so my poor son would occasionally wake up late at night to see me, his mom, lying on the floor watching the little critters scamper all through the habitats. Orac and Ms O are truly admirable to do this. WOW! Lots of work. I am always grateful to the people who provided foster care for my spectacular cat. A cat gave birth under a porch in a small city: she was later killed by a car so the home owners- an elderly man and his daughter who foster pugs- found homes for two kittens immediately and took care of mine ( 2-3 weeks old), even getting him fixed. At 4 months, a worker in the vet’s office, took him home and to the foster system’s weekly shows at a pet store; later her sister took him ( who had dogs and cats) until I adopted him at 6 months. He was raised with dogs and was extremely active and agile : I guess he HAD to be with dogs/ puppies. Maybe that’s where he learned how to fetch. My eldest cat, who was raised from a seed, was able to play fetch. Mini tennis balls and a 30 foot run were the key. “GO TO SLEEP”. Hasn’t got ” GIVE ME FOOT” totally yet, I’m working on it. My cat is also somewhat puppy-like in that he follows me around. (Also rather like my two year old nephew.) No fetch, though, and he doesn’t seem to understand any English. He was a stray that my mom started feeding, and he was kind of a scardey cat when I first encountered him, hence, in part, his name, Chicken. At last you have displayed your true, arrogant, quackery based ways. You have gone from pharma shill to puppy mill and it is obvious that is all an attempt to distract . . . — oh, look, cute puppies! I, for one, welcome our new puppy overlords. We are as good at running a puppy mill as we are as pharma shills. We’ve sunk a lot of time and a few hundred dollars into these puppies, whom we will be giving up to be adopted when they are old enough, which, sadly, will be fairly soon. Where’s the profit in that? If you can figure out how to bottle puppy breath, you will make millions. Don’t blame me for the cat blanket. Koff. * BTW, is that a Vienna sausage on the puppy’s leg, or was he just happy to see you? Thanks for being part of the Grand Rescuial Band. I’ve been putting in a lot of effort trying to socialize semiferal (and abused) cats and kittens lately to cool my head and have the scabs to show for it. May be superior to cryotherapy for treatment of verruca plana, if a hard sell. ^ Dammit, what’s with the eating of asterisks at the beginning of lines? There should be one before the final graf. Dwarf hamsters are even easier than puppies. They don’t live very long though, so they gave the kids some real life lessons. Over two to three years we had a few small funerals. Le sigh. For a while we were on speed-dial with the local SPCA, whenever they came by a litter of feral kittens who needed socialising. The theory seemed to be that I’m barely half-domesticated myself, so I could provide a kind of halfway stage for them, It was a time full of satisfying accomplishments although my wrists now look like chopping-boards, covered with little white hairline scars. Then one of the ferals decided to stay with us and she does not play well with others. It was a time full of satisfying accomplishments although my wrists now look like chopping-boards, covered with little white hairline scars. A couple of dozen minor hand wounds are probably not the best look for a surgeon to be sporting, now that I think about it again. I’m more a cat-person, so I don’t mind the cat blanket. I’m so pleased you fostered a rescue dog. Back in 1998, my family took in a Border Collie cross who would have been euthanased had we not given him a home. Jesse was a lovely dog. Happy new year, from a long-time reader & fan. If you vaccinate the puppies, will they get doggie-autism? I knew a couple of people who were convinced their dogs were autistic.sigh In both cases I’d say under socialised, but what do I know? I had a dog who was on the doggie autism spectrum, if such a thing exists. She was uninterested in dogs, cats, humans, or any creature other than my dad, and merely tolerated being petted. She was, however, a good and smart dog, and we accepted her as a family member and kept her until old age. She was fully vaccinated… and treated with early anti-flea pills. That didn’t make her antisocial either. Including socks, shoes, and books. Totally unexpected to read something from Orac that is substantially free of respectful insolence. 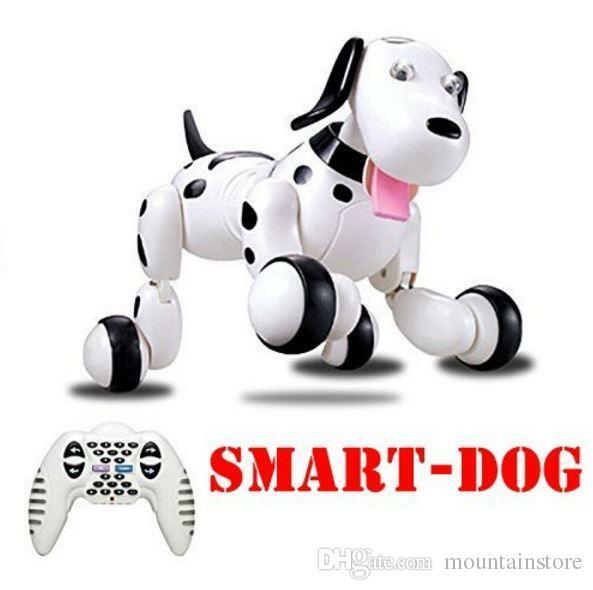 Is this the dog of the future? The hilarious thing is that the puppies, who all used to be able to fit on my lap, still seem to think that they are small enough to keep doing it. We have learned that, with German Shepherds, this is a feature and not a bug. Of that, I have little doubt. These puppies all weigh around 6-7 lbs each now (up from under 1 lb each at birth), but they still think that they’re tiny enough to fit on my lap the way they did three weeks ago. They all manage to pile on a bed that’s now a bit too small for them too, which is hilarious when they do it. It looks as though it would be uncomfortable, but somehow they make it work, and it’s cute as hell. I knew a great dane that thought he was a lap dog. Sweetest thing. One time when I was at a sleepover at his family’s house he came to snuggle with me as I lay on the floor in a sleeping bag. He stretched down the entire length of my body. He also had a habit of leaning on people he liked. Back when Pontius was still an apprentice Pilate, I looked after our neighbors’ dog over Christmas one year. It was a beast of far northern heritage and substantial abundance, and he lived outdoors – a bull in a china shop being somewhat delicate by comparison. I awoke on the night before Christmas with a very large furry bedfellow and my father standing at the door to my bedroom, splitting his sides with laughter. Dad had gone out to the garage to retrieve some hidden Christmas gifts and the dog had slipped by him, come into the house and down to my basement bedroom (how he knew where to go is beyond my ken). The dog apparently was trying to hide under me. The mom of the family belonging to that lovely great dane told us about how he was a great help with solicitors. Someone would ring their doorbell, and she would answer with this huge dog behind her with his “are you my new friend?” face. Except all the solicitor would see behind her was a very excitable dog whose head was at her shoulder height. The solicitors never stayed very long. Unfortunately the lifespan of those lovely dogs is quite short. It is not much more than a hamster. It seems the bigger the mass and the sociability that is bred in, the more health issues also follow. Is it the puppies’ fault that your lap shrank? My mind flashed to the UK and I had a vision of him gnawing on a lawyer’s leg. Unfortunately, it is still a work in progress to get one. Basically, I’d need a place to live with the dog (and a good paying job), a car (public transit is out of question with a dog that size) and maybe a few other thing that I haven’t tought off. Here it is anyone who comes to your door, rings the bill and solicits for money for their business, your vote for their candidate, cash for their charity, your signature for their petitions or your faith for their religion. Or it just means anyone who ignores the “No Solicitors” sign by the doorbell. A friend of mine had an Irish wolfhound that thought he was a lap dog, she wasn’t tiny, but there are pictures of him on the sofa with just an arm or leg showing she’s under all that dog. Sadly he didn’t even get to live out what would have been a shortish life span as he got bloat and although she recognised the symptoms and rushed him straight to the vet who operated immediately he didn’t make it. Bloat is another thing larger dogs are more at risk from and although my two are only large, not giant, being German Shepherds I have made certain I know the symptoms. Some of those big dogs are sneaky about getting on your lap. First they will rest their head on your lap, then it is one paw, and before you know it you are pressed against the back of the couch covered by dog. Chris, my late Doberman was a total sneak like that. We’d done a massive cleaning of the carpets, which left him stressed out. Every time he thought he was safe, we’d rearrange the furniture to clean a new spot. By the time we were done, he was exhausted. He came over, plunked his head in my lap with a sigh and, after a couple minutes, there was a paw in my lap. A few minutes more, the other paw. Five minutes after that, 60 lbs of Doberman who desperately needed snuggles and comfort. I didn’t have the heart t kick him off as he just sighed with such relief when he plunked down on top of me. This rule holds for Newfies, as I learnt when dog-sitting my then-boyfriend’s Bear, who outweighed me by 40 pounds but insisted on being a lap pup. He was also extremely mellow, and got along with the three cats I was fostering (and my own, not-speciest-atall cat, who even tolerated human toddlers who tended to interpret the tail as “handle”). Ditto for teacup saucer-eyed Mastiffs like the one that owns my mechanic. If I’m ever situated properly to be owned by another dog, I lean toward the biguns, despite the slobber. Although labs and lab mixes (and some smaller, yappier, bitey-er breeds) are irresistible too, I experience them as I do nieces, nephews, and grandchildren (theoretically speaking), that is, to be corrupted spoilt and given back to their parents. Who knew that so many minions would be inspired by an adorable puppy video to mention cats. It’s probably cultural but Newfies’ an insult around here in my province (like *tard) and every regular here know that, very often, threads evolved in vastly different directions so cats discussion in a dog thread does not register as offtopic. Finally, I don’t remember reading the kfunk pseudo used very often but I do remember seeing it + I vague souvenir of it being used by Travis. On the other hands, I’m knee deep into Brian Deer’s website and RI is next on my list so mental context switch have a good chance of throwing me off (i.e. making a mistake). Primary reason I haven’t been chasing sockies in the 4 last months even if sometime, I had doubts. We had a young dog that pulled off a baseboard from behind a radiator, blocking the kitchen door, and she chewed away a foot of the top of the moulding. We should have named her “BuzzSaw”. We had a young dog that pulled off a baseboard from behind a radiator, blocking the kitchen door, and she chewed away a foot of the top of the moulding. Heh. My aunt and uncle once adopted a St. Bernard puppy, who went on to happily live at the local fire department after a not-dissimilar remodeling of their kitchen. Lab and maybe a bit of dachshund? Any idea what type of dog the father was? I thought of you and the puppies (having seen them on FB) and Dora as we cruised through Detroit on our way to and from Toronto for Christmas. The videos are so cute and I sure wish we had those neat pens in my days of puppyrearing! We had to keep them in boxes or improvise with chairs and such. Luckily they were dachshund puppies and only three of them, but there were also three small children to complicate the commotion! Thanks for sharing and have a very Happy New Year. I think by fostering them out, you are losing a tremendous opportunity to have your very own “Dogs of War” to unleash on the anti-vaccine and pseudo-science nuts. A vicious fearsome pack of puppies to slobber all over your enemies. What more could a glowing box of lights need? Congratulations on being owned by Dora, and best of luck letting go of the tiny terrors. I would foster if I dodn’t already know that I want to keep them all. Looking at those puppies I think “Dogs of War” might be a bit of an exageration. I can see it now, “Famous anti-vaxer licked to death by rampaging pups”. A long, long time ago when we were still teenagers a friend and I did one of those crazy road trips, traveling everywhere. One fellow we visited had two dogs: a small terrier and not-quite a puppy anymore great dane. We had fun watching the smaller dog chasing the great dane around his large yard, then ignored them to chat. When we’d first arrived I had petted the great dane and he apparently took a liking to me. He was a big dog that weighed substantially more than me. While the three of us were standing and talking I didn’t notice the great dane sidle up alongside me. Next thing I knew I was on the ground with a very surprised and very heavy dog on top of me. Yes, he had leaned against little old (young) me. Apart from enduring the laughter from the others neither the dog nor I appeared to suffer any long term emotional scars. My friend’s ( now ex) husband owned a series of large dogs ( Danes etc) but the one I knew best was an Akita. He liked to “dance with ladies”- which meant that this great big slobbering – but beautiful- mess would put his huge front paws on your shoulders and look soulfully into your face for as long as you could tolerate it, slow dancing. I’m 5’6″ so he would be at least my height when posed in this fashion. I believe that he weighed about 140 lbs. My friend fed him a mix of canned and dry food with hot water, his “stew”, in a large mixing bowl which he would consume like a desperate, starved thing. bright lights, his owner said. I also rescued a large yellow Lab, Spy, who was similarly inclined several times ( different owner). My aunt breeds rough collies. At least three of them, all related,thought they were lapdogs. Which is kind of uncomfortable when the dog is easily fifty pounds, with half of that being hair. Some of them like to jump, too, and one will sneak up behind people and jump on their backs. That said, she hasn’t had puppies in a while, and I miss that. A small friendly wolf pack, bumbling across the yard, determined to untie all shoe laces and lick everyone they encounter to death. I hope Orac’s bunch find good homes- also, don’t worry Orac: puppies that get plenty of love and play and warmth do just fine. Some of them like to jump, too. You have not experienced the joys of mammals who think they’re parrots until the cat sequestered in your bathroom for anti-social attitudes toward your constant companion of 15 years goes from ounces to kilos, with claws, when you’re trying to exit the necessary room. From her POV, it’s fortunate to be a lone cat, now. She has the run of the house and is entirely treated as a felid. Plus she’s a tool-user: periodically, she still flushes the toilet 30 or 40 times in quick succession to get my attention. I love the idea of a toilet-flushing cat. My dog (17 lbs) has figured out that knocking over the garbage can will always get my attention, and she does this when she doesn’t like her food. I’ve asked you to provide a definition for “antivaxer” many times and you’ve failed/refused to respond. Can you enlighten us and define “antivaxer” in 50-words or less? Q. How are puppies like respectful insolence. Don’t you get it? You’re out of your league! your analysis of complex issues is incredibly simplistic and your attempts at levity ill advised and juvenile. Because you read a few article about the brain or computers, doesn’t mean that free associating concepts you discovered therein willy nilly makes any meaningful criticism . Pedestrian, prosaic and parochial come to mind as adjectives for your commentary. I left out plodding. We often ridicule Teresa Conrick’s “science”- she’s a few grades above you although just as wrong. Orac is extremely tolerant- he needn’t answer to you..
Orac would be a great veterinarian! If Orac wants to talk about puppies instead of answering legitimate questions about defining the term antivaxer that’s fine. In this forest of respectful insolence, I often feel like a rabbit being chased by a pack of wolves and you’re the Alpha Male. I’m weary, please call off the wolf pack until 2018. I’ll take the decision later. In the meantime, keep running. Orac? Under 50 words? Unlikely. That’s why I keep reading. Since there are three M’s in Chemmomo how about “3M” as the new nym? If you spew respectful insolence on the internet about vaccine safety advocates, you are one of “Orac’s minions”. It seems my comment fell upon deaf ears ( MJD). I am better understood by large tabby cats, beginner ESL/EFL students, dining room tables and random credenzas. My cousin’s widow adopted a Shih Tzu- Yorkie ( Shorkie) 6 months ago, About a month ago, the puppy began chewing on connections/ pipes of appliances made of plastic and METAL. She tried various bitter products but the dog persists so she has to resort to putting her in a crate whenever she leaves the house ( which she wanted to avoid doing) She teaches so she’s only gone for a few hours at a time (home for lunch). This started before school holidays. Nothing else new has happened there. The dog trainer called it separation anxiety. I studied a bit of animal psych..but I can’t even guess. Hey you gossiping wootards. Did you hear about Jake Crosby? I heard that he’s now promoting the aluminum etiology. Which could, of course, increase histamine‐releasing mast cells in the brain. Although biosynthesis from the tuberomammillary nucleus (dependent on dietary histamine over sum of competing amino acids) is generally thought represent the extent of this neurotransmitter, researchers have determined—in the rat at least—that mast cells can account for 90% of total brain histamine. In every trial this has been tested on—from using histamine itself, its antagonists such as cimetidine, tuberomammillary ablation, and histadine decarboxylase inhibitors—histamine has been shown to decrease learning, have antinociceptive properties, and decrease social interaction. Schizophrenics have been found to have levels 2.6× the histamine concentration of controls—a neurotransmitter antagonized by acetylcholine (perhaps explaining the ~5× increase in smoking found among schizophrenics). This is ostensibly from immunogenic proteins such as gluten, which can both explain the high histamine levels and consistent findings of high gluten exorphins in the cerebospinal fluid in patients having this condition. The celiac intestine has ~3× the mast cells of controls, and fluorescent‐labeled mast cells have been proven to migrate to the brain. There is great interpersonal variation in brain mast cells, ranging from zero to thousands. As the single neurotransmitter exhibiting the highest range, histamine should certainly not take a backseat to serotonin—or opiates, nor glutamate: neurotransmitters historically implicated in the etiology of autism and schizophrenia by lesser people. Your credibility score had been zero. Congratulations on dropping into negative territory. Do you have a puppy nearby to console you? Travis is usually pretty prompt with that sort of thing. He does NOT deserve a puppy. A citation for what? Be specific. I can support everything that I’ve said, but not one article can do that. Why are you using the cross-product operator as if it were an arithmetic multiplier? No, wait, I can guess the answer. Bye bye. You don’t actually think I would consider “about three times” a vector product? do you? Our childhood dog was a Welsh Springer Spaniel. When she had seven puppies they all got Welsh names. The only ones I remember now are Dylan and Myfanwy. Dylan had been renamed Fluffy by his heathen, Philistine owners when we met them on a walk a few years later. Dora looks like a lab hound cross to me. Doug Jones has been certified the winner in the Alabama Election. Democrat Doug Jones’ historic victory over Republican Roy Moore was declared official on Thursday as Alabama election officials certified him the winner of the special Senate election, despite Moore’s last-minute lawsuit claiming voter fraud. one of the reasons Mr Jones won is because African Americans came out in LARGE numbers – IIRC even more than they did for Obama in his elections – they are a significant minority ( 26%?) of the electorate even though efforts have been made to limit their participation ( voter ID rules especially). Also, it’s likely that many regular republican voters in “red” counties sat out the election because of disgust with Moore. I hope that 2018 will show increased participation by all voting groups. I think what you meant to say is that no puppy deserves him. I just celebrated my second Gotcha Day with my rescue, Juno. She’s a Carolina Dog, the only native breed of dog in the lower 48. She was a neglect case; her owners adopted her as a puppy but banished her to the backyard when they adopted a baby four years later. She was dreadfully underweight, and while her foster did get some of that back on her, she was still thin when I got her. She’s an incredibly sweet, smart dog. Bladder of steel, never chews, well trained, well behaved. For the life of me I can’t get why her owners let her get away from them. She’s a great dog. And I’m very lucky. Dog flu is going around my area. When the vaccine became available, you better believe I got it for her. No signs of autism yet. She did sleep most of the day after the shot. Dog flu is going around my area. When the vaccine became available, you better believe I got it for her. No signs of autism yet. Your understanding of typical and atypical canine behavior is simply too limited, Panacea. No, Michael. Your understanding of and ability to detect sarcasm is what’s limited. rs – thanks for the smile ! Something tells me that Kevin Barry’s attempt to gin up 100 grand has gone to the dogs. I mean, seriously, anti-vaxxers demand less from their cars. They’d be happy to drive flaming pintos. One person gets into a car accident after having a vaccine, and they’d blame it on the vaccine, rather than looking at the weather, the type of car (s) involved, or the drivers. Or for that matter, the hundreds of other people who didn’t get into a car accident that day. Alain: By “girlfriend” did you mean ‘Jake’s right hand?’ or “Milo Yanniopolis?” Because if Jake actually had a real live girlfriend, either his mother figured out how to make statues live, or the police need to look into that. None of these answer, I meant Travis who posted as biochemistry12 and who, at one time impersonated me on the gnat’s blog (one of the blog post about transgender). Al (still praying in front of the porcelain god, not as often). Oh, I missed this. That floating stool pulled the same thing with my name at AoA. there will be a financial collapse in ” 24 months” and war with North Korea! Same as last year. I suppose they have survival products and videos on organic gardening to sell. I decided against looking at whatever swill was spouted by AoA, TMR, Jake and similar loathsome venues because I am not after all, a super being- I have limits. At any rate, I send my regards and best wishes for a productive and happy 2018 to everyone concerned about the frightening encroachment of woo, pseudoscience, altie BS, fake news and misinformation on the internet! It’s up to us to fix it!! Bitcoin and vaccines?We have all the criminals Gates Soros et-al with all the spoils from harming our kids and harming the world wide populations of the world.So what I believe is that there is a big rush to get some of the ill gotten gains hidden before Trump does a Saudi purge and confiscates all the ill gotten gain’s back from the monster criminals and slam them in the slammer.Hence the rise in Bitcoin which I beilieve is harder to track and trace who owns what.Trump will take the ill gotten gains back and pay off the money unaccounted for at the Pentagon and the lesser official national debt.How many billionaires will it take to do that ,not many.As we all know on here there are a few at the top making a pile of money whilst nations are starving and dying and being controlled and being made nonfunctional through vaccine induced disabilities these abuses are about to be punished. Anybody who can make sense of this is made of sterner stuff than I am. The FDA approves first shock wave device made to heal wounds. Would this be considered integrative medicine or conventional medicine? Assuming the product works as described and follow-up studies confirm that, it would be conventional medicine. Wouldn’t it also be considered integrative medicine in that the provider uses a natural and less invasive healing science (i.e., shock waves) to facilitate the body’s innate healing response? “Natural”? “Less invasive” than what? Did you even read your own blurb? Orac: I just had a thought. Some of those puppies look like dalmation mixes. Make sure the puppies have their hearing tested before they leave for new homes, since deafness is a common problem for dalmations. Alain: None of these answer, I meant Travis who posted as biochemistry12 and who, at one time impersonated me on the gnat’s blog (one of the blog post about transgender). Oh, I missed that in the chaos leading up to the holidays. Then again, I don’t look at Jake’s blog at all. I’m trying to bring my blood pressure down. I ate at my cousin’s place last Saturday. He has the habit of thawing frozen items on the countertop or on top of the clothes dryer. Bugs and other creature absolutely love his habit. Oh no! I hope you feel better soon. I say as I am about to toss Christmas dinner leftovers. I definitely did not get drunk since Saturday night but I sure wish I could. He has the habit of thawing frozen items on the countertop or on top of the clothes dryer. Dare I ask what he was defrosting? Perhaps it’s just me, but most people I know with in-home clothes dryers also have running cold water available, as well as microwave ovens. He manage 3 fish warehouses for $DAYJOB. Those would be things I would be very, very carefull with. Not thawing them outside the fridge. The same with chicken. I would be careful with those also. When I get a bag of frozen scallops I repack them three to four in a small closable plastic bag (I am the only one who eats them in this house). When I want to eat some scallops I just take one of the little bag, and put them in a bowl of water for about ten to fifteen minutes. Then finish thawing in the fridge. Dry them off and fry quickly. Dear G-d, and he manages storage of shellfish? Cold. Running. Water. I once had to do a turkey in the bathtub, but your tale is amazing. That’s what happen when one’s $DAYJOB require him to work over 50 hours per week of heavily physical work and he arrive home, drained out. I did try to instill some good home skills but it’s rinse, lather, repeat. He’s slowly learning, veeerrrry slowly. Alain (feeling better today, I can eat). Ugh. Countertop I’ve done, but I keep a clean place, and make sure to keep an eye on the food. But clothes dryer? Seriously? You are obviously a pharma shill. It’s far healthier to experience puppy breath the way nature intended. My lab Friday, in the 90’s, (named after Heinlein’s Friday) gave birth to 16 puppies. What an amazing time. Trying to keep all the pups fed was hard work, I started them on puppy chow mush at about week old. By time they were 8 weeks old they weight 30 lbs or so. They were all escape artists, what joy it was trying chase down all those pups. Luckily they ran as a pack. Friday at times thought she was a lap dog and would launch herself from across the room to land in my lap. Oh, she weighted 90 lbs, no fat. She was a great dog, retrieved her first duck at 5 months old. I still miss her to this day. Happy New Year to everyone. I have only 18 days to retirement and 28 days until I move to Thailand. I don’t think you should pick on Jake anymore, he’s a nice guy. I think instead we should all start reading more about cytokines, histamine, phosphorylated microtubule‐associated proteins, aluminum, mast cells, and inclusion bodies. So persistent interferon-γ release from T cells, and mast cell induction from peripheral inclusion bodies, can lead to the sort of psychology characterized by the schizophrenic—or the grain eater who doesn’t eat enough tryptophan to counter tryptophan dioxygenase. Perhaps ORAC can tell us about the presentation of celiacs, and either deny or confirm any characteristic psychological findings. [†] I thought about Tim Curry just now, for obvious reasons. [‡] Rubio-Perez. “A review: inflammatory process in Alzheimer’s disease, role of cytokines.” The Scientific World Journal (2012). [¶] ⟵Pilcrow baby. A fμcking pilcrow! How cool is that? I know this isn’t related to this post, but Shaw and Tomljenovic’s paper was retracted. Some good news to start off 2018 with. Now I am become Shiva, retractor of papers. Happy new year, people. Here is a tribute to turning the frekkin’ frogs gay in 2018. I think the over/under until Mike Adams claims you’re torturing these dogs for Big Pharma is approximately 7 days. Maybe 10. Then I’ll have to post more cute puppies videos soon. The puppies will be going back to the shelter on Sunday to be adopted out to forever homes, and after that my supply of cute puppy videos will dry up. I expect that the puppies will be adopted out pretty fast because they’re so damned cute. I will definitely miss those cute little buggers something fierce, but they are getting to be a real handful to take care of now. Have they had a chance to play in the snow? Also, I hope your basement has a shower and you have a set of downstairs versus upstairs clothes. I kind of do this with certain kinds of gardening, like planting fall bulbs in the rain. Well, what am I going to read on Facebook then? Trump tweeting something about something? Sigh. I have to admit, ORAC, that picture is astoundingly good. I think you’d be able to sell some pictures of that dog, if you needed the money (I did hear about that plane ticket, must be tough). Gosh, those pups are cute! If this was a Facebook post I’d definitely give it a . I can see where they’d get to be a handful, though… I am a cat lady, but I like dogs too and have always said I’d have one if I had the living space. She (Mama) is cute, too. Looks friendly and sweet. Best of luck with all of them. because it’s contaminated with mold, pesticides, metals and chemicals. Maybe he just wants them to send in samples for his famous testing lab. Mike of course would never smoke any. Hahaha, no. He’s an idiot, a misogynist, a homophobe and very probably a racist. He thinks the sun shines out of Wakefield’s and Trump’s butts. He’s nearly 30 and can’t figure out how to be human. Most people have some social skills by that age, autistic or not. Honestly, you’re only supporting my theory that you are, in fact, a sockpuppet. Even if you’re not, you’re still stupid. I see a lot of words in your post, but no indication that you know what they mean. I think you’re quoting Shaw and Tomljenovic, and as pointed out above, the paper, as all their previous papers were, has been retracted. In other words, the editors do not believe the paper has any basis in fact. I am not quoting anyone. I had come to my conclusions after reading dozens of articles on the topic and can prove every word that I say. Perhaps you should ask for clarification if there is something you’re having trouble comprehending. You had misrepresented my post, ostensibly because you’re ignorant. I wasn’t talking about antibodies; I was talking about cytokines, tryptophan diooxygenase, and mast cells. I really doubt that and enzyme will remain induced ten years after a vaccines. Antibodies themselves are relatively harmless; the real danger is with the cytokines—or specifically, the enzyme’s they induce. So are you going to keep spinning your propeller hat or can you say something of significance? I had come to my conclusions after reading dozens of articles on the topic and can prove every word that I say. You were asked already to provide supporting evidence and failed. I smell the distinct odour of Fendelsworth. LOL. I’m not the ignorant one here, dude. Perhaps you should try reading an actual scientific journal sometime, not the pay-for-play bottomfeeding journals your kind favors. Why don’t you go grab your club and go back to your cave. I don’t think you have anything to contribute besides grunts, red herrings, and strawmen. Look Julian, I had said before that no one article provides ‘proof.’ What exactly do you wan’t to know? I can show you experimental evidence for the entire concept, but only one step at a time. It would take me all day to lay down all of the experimental, clinical, and epidemiological evidence. You can ask me to support one claim at a time, or do your own reading—or do nothing, and keep pretending that autism is genetic so you can keep eating pizza. I can show you experimental evidence for the entire concept, but only one step at a time. Exactly what claim, in the comment(s) under review, would you like me to prove first? Which could, of course, increase histamine‐releasing mast cells in the brain. Provide evidence that aluminium adjuvants actually DO increase histamine-releasing mast cells in the brain. …researchers have determined—in the rat at least—that mast cells can account for 90% of total brain histamine. Show good evidence that this has been replicated in large scale studies in HUMANS. is it the gluten or the casein or both? It would take me all day to lay down all of the experimental, clinical, and epidemiological evidence. Oh is this Dan Vaccine Papers Man trying out a new shtick? Sounded like Fendelsworth to me. Has anyone come across this coming antivax scamfest? It looks like an AutismOne road-show. I came across it while checking out not-doctors Jeff Senechal and Randy Tent, who together are “Diverse Health Services” and sell (inter alia) the “GlycoPlus” placebos from Thom and Candice Bradstreet… who have spent the last few years exploiting their relationship to the late unlamented Jeff Bradstreet (in a fitting tribute to his career of fraudulence and grifting). Mast cells are increased in the celiac intestine roughly threefold,⁽¹⁾ and have been shown to migrate to the brain in rats⁽²⁾ where they can account to roughly 90% of total brain histamine.⁽³⁾ Concentrations of mast cells can range significantly—from zero to thousands.⁽³⁾ Casein also has a few enzyme resistant proline–glutamine repeats,⁽⁴⁾ although less immunogenic than gliadin. Histamine has been shown to decrease learning in rats in at least four different ways: tuberomammillary ablation,⁽⁵⁾ inhibition of histamine decarboxylase,⁽⁶⁾ cimetidine receptor blockade,⁽⁷⁾ and through the injection of histamine proper.⁽⁷⁾ All of these studies show the same trend. There’s tons of proof out there if you’re interested; but I suspect you’d feel better abut yourself clutching to dubious genetic associations, weak methylation hypothesis, and sociological explanations with little merit—basically everything that has nothing to do with vaccines. The funny thing is: nobody here will actually read these studies, besides perhaps Dochniak.. . .
I’m fairly certain that anyone who examines this issue in an unbiased manner will come to similar conclusions. What is this Imler-bay whereof you speak? Following the twists and turns in the GcMAF market is probably evidence of too much time. First the market was dominated by the ‘MAFActive” products, from Lesley Hutchings. Then she disappeared from the scene after persons unknown dobbed her into the French authorities, under mysterious circumstances, though her business rivals were all very sympathetic. So the field was free for Candice Bradstreet with her “GlycoPlus” products. She has divvied up the US and Canadian markets between a couple of like-minded friends, and also supplies not-doctors Senechal and Tent on the side. Coeliac/celiac is not a cause of autism. I therefore can’t see why you chose cite 1. In rats. I wanted proof that this occurred in humans. …where they can account to roughly 90% of total brain histamine. Still rats, no humans so far. Casohypotensin acts as a bradykinin-potentiating peptide. Induces hypotension in rats. Studies 5-7 also mention rats. What you have is plausible, but not convincing. As I asked in point 2, show us proof that this occurs in humans. Also, none of your cites contain evidence that aluminium can induce mast cell production or celiac/coeliac disease, so what you have given us so far is tenuous. There’s a better article in the New York Times, but I don’t have the link right now. This sounds like something that could use some insolence. I saw the post, but I didn’t check the author’s name. I thought the style was awfully similar. Me maxima culpa.